4.1 out of 5 based on 46 bloggers and 17 commenters. 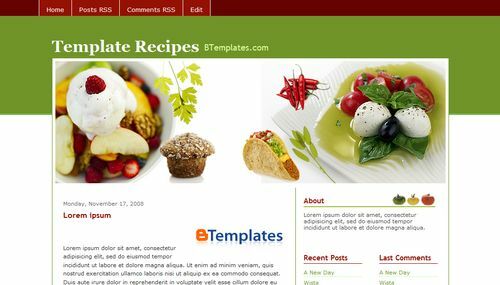 Recipes is a free blogger template with 3 columns and right sidebar. I am using this now but since I have prefer to put bigger pictures, could you please help me widen the body a little bit? Your kind help is appreciated. How do you upload the seperate jpeg image????? I just loveee this template but can not put it in my Blog spot as its showing errors pls send me the simple HTML link of this template or pls try to fix my problem online. I just clicked on the above image and when the large version loaded up I saved the image and then loaded in in the picture section above my blog post. Problem solved. I downloaded this ..But looks only 2 column page. My comment button also not working. How can i add labels on top near the red line. I like the template. I can’t seem to place it on my blog spot. It continues to say error. What am I doing wrong? Please help. 3. then you need to click “Copy” on the xml file with the rigth bottom of your mouse..
4. and Finally you need to paste the xml file into a folder on you computer. I downloaded this beautiful template. The header image of this template is not being displayed. Instead ‘green color’ is displayed at header section. Can you let me know how to display the header image in the header section of this template? The header image is not displaying, what to do? To get the image to show up, in your dashboard go to LAYOUT – > PAGE ELEMENTS. Under the header portion, click EDIT where “Picture” is. It will then allow you to upload the header image that comes with this download. thank you very much for the wonderful template. How can I used whole page space. In other words,how can I widen the body ? On left and right side there is lot of space and I would like to use it. Any suggestions. Hello, i love this template, but i cannot use comments …how can i do that? The solution you are looking for is in our FAQ. Wow great template for blogger Recipes. I will try this one on my blog. Thanks!